After more than two decades of ongoing violent conflict, armed groups—however fleeting their existence—have become an integral feature of the eastern Congo’s social-political order. They are not a temporary aberration in what is otherwise a normal society. They are at the heart of the way power is exercised and experienced. Moreover, armed groups do not stand apart from either society or the state apparatus. They are deeply embedded in social networks that regroup state and non-state actors and that stretch from the very local to the national and sometimes the sub-regional (Great Lakes area) and international levels. 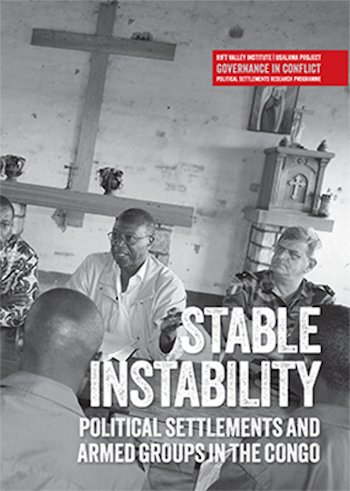 This report analyses the stability, inclusivity and levels of violence of both the political settlement of the Congo as a whole and of political settlements in the conflict-ridden east. It shows that in each of these political arenas, armed groups and violence play a different role, and examines how these arenas mutually influence each other. The relative importance of armed groups as either resources or threats to the power of the presidential patronage network shapes its policies towards the east, such as initiatives for military operations or negotiations. These policies influence the role that armed groups play locally. This role, in turn, shapes to what extent and how national politicians engage with armed groups; for instance, whether they support their mobilization or demobilization.